While most of my posts are about children and how I educate them through STEM related projects, this post is mostly technical. It is behind the scenes of my work with the kids and how I make things work. So bear with me through this simple yet technical explanation. A few months have passed since the beginning of the school year and the children at Digitaf kindergarten are becoming more and more skilled at using ScratchJR. ScratchJR is where young children (ages 5-7) can program their own interactive stories and games. In the process, they learn to design projects, solve problems, and express themselves creatively on tablets. I had just started teaching the children about electrical circuits. In addition, we have a lot of electrical components that the children dismantled from old toys in the past year and I had to find a way to use the LEDs, motors and actuators we've been collecting. This is where I got the idea of combining Scratch with an easy to use programmable board. S4A (Scratch for Arduino) is an offline version of Scratch and is compatible with Arduino, one of the most popular open source programmable microcontroller. There is a piece of software (firmware) you need to install into your Arduino board to be able to communicate with it from S4A. Once you've uploaded the firmware to the Arduino you can use digital and analog input/output (I/O) pins and make endless things. While S4A is a great tool to learn the basics of physical computing, it requires fine motor skills, the use of jumper wires and is not suitable for young children. I needed to find another solution. Circuit playground is a new all-in-one board by Adafruit, aimed towards education and suitable for beginners. It features 10 NeoPixel RGB LEDs, a variety of built-in sensors and alligator-clip pads around it so you don't have to solder or sew to make it work. It is a great way to practice programing on real hardware. I modified the S4A firmware and made it compatible with the Circuit Playground. It was a challenging task to work around the structure of blocks, but I managed to use the data from most of the sensors. I got perfect readings from the Temperature, Sound and Light sensors, X/Y Accelerometers and Switch (using Analog 0-5 inputs) and both Buttons (using Digital 2-3). In order to keep the data as is I had to manipulate some of it to avoid casting of sent and received variables. I assigned pins 6 and 9 as Analog outputs, they can also control a servo motor in the range of 1 to 180, pin 10 is a Digital output and I managed to keep pin 13 as the indicator LED. The 10 NeoPixels are controlled by R-G-B inputs and LED number selection (0-9) to commit the color change. You can download the S4Playground_firmware.ino and the S4Playground.sb FILES from my github folder, upload and enjoy. Please don't hesitate to comment on my work ask me anything or suggest modifications. I can't wait to start working with the children on it and would love it if YOU share things you made with it. It has been a long time since last post and a lot has happened since. The school year is over and I am on summer break. To sum up the year in a couple of words - challenging, inspiring, and lots of fun. I had learned a lot from the experience and there is more work to do for next year, which would be the children's last year before 1st grade and the plan is to get them ready and above average. Just a note for the new readers: I work as a technology teacher at Digitaf, a technological kindergarten located in an immigrant neighborhood in Holon and our mission is to improve the area through the kids. Most of the kids in Digitaf don't have a computer at home, they started the year with nearly no technological knowledge. Nowadays every toddler knows how to handle a smartphone or tablet, but they started fresh. By the end of the year they learned how to use a digital camera, zoom in and out and some of them even know how to transfer the pictures to the computer via SD card. They learned to use a desktop computer, starting from basic use of the mouse, through different 2D raster programs, web searches and even 3D design using Tinkercad. We taught them how to measure lengths and weight, disassemble toys and electronics and connect materials using a variety of techniques, they even learned how to choose a 3D model from Thingiverse and send it to a 3D printer. Eventually they all gained a large set of tools to be creative and bring their ideas to life. A few weeks before the school year was over I became a dad, my first daughter was born and I can't be happier. She is so small, gentle and sweet. Since then I still have moments when I realize I'm a father. Just after Nina was born, my spouse and I decided to try the co-sleeping method. It's basically putting your baby to sleep with you in bed. This method is encouraging breast feeding, it gives the baby a sense of security and a better sleep. Nursing babies get a quick response to their hunger during the night so they continue the sleep cycle. In addition, the child feels the breath of his parents and synchronizes his or her breaths. In order to make it easy to move her from her bed, we decided to attach her bed to ours and I made it my mission to build her bed by myself from scratch. I started by making a 3D model with Solidworks. The bed floats on an acrylic frame and attaches next to our bed. I cut the wooden bars, sanded them and connected everything using screws and wood glue, I rounded the corners from the inside and outside and varnished the wood. The frame of the bed is made out of laser cut 4 mm acrylic sheets, fastened with 3D printed connectors I designed. Nina is enjoying her new bed very much, but I just realized that a cradle is usually good for about four to six months... I might be back at the workshop sooner than I thought. Kids love their toys, playing with a new toy is interesting and exciting for both kids and adults. We find dolls, tractors, action figures, robots, blocks, jigsaw puzzles and more valuable enough to give up our time, living space and money. Playing with toys is an everyday part of a family life. At Digitaf kindergarten, we initiated a toy program at the beginning of the year. Every week is focused on a different child. The child of the week chooses a toy. We research, plan and design the toy and then the other children join to help gather the tools and materials needed for the project and we start the building process. 1. 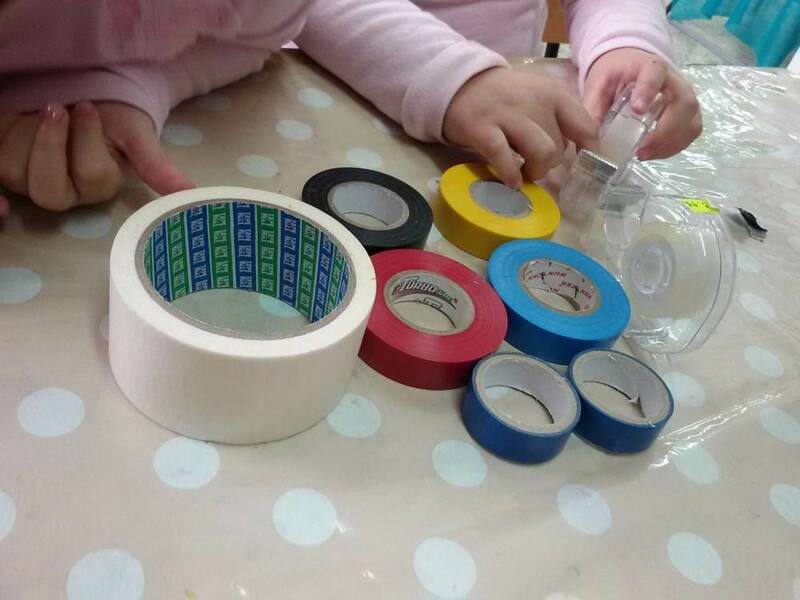 We noticed the children enjoyed the work and the toys served as a tool for rich sociodramatic play. 2. We found our kids had a few lacking skills. 3. We needed to teach new methods of attaching things together. At the end of the week we hold an exhibition with the child of the week acting as a host to explain the process of the toy making. We try to make the toys out of recycled materials and to use parts from toys we disassemble. Each project is totally different from the other. I try to direct the each child to use as many tools as possible and encourage the use of the 3D printer to make connectors and various accessories. Here is a skateboard one child has made with 3D printed wheel holders. This week one child wanted to make a jigsaw puzzle. She loves the movie "Frozen" so she drew her favorite characters on a 90x70 cm wooden board. We then went on a trip to the local Fablab. A digital fabrication laboratory, with CNC machines, laser cutter, vinyl cutter, electronics and wood workshops and 3D printers. I explained about the machines and showed the kids a few projects of mine and others. We then went to the laser cutter to cut the puzzle. During a project the child of the week is in charge and is responsible of the entire decision making process. They invite other kids to help and instruct them what to do. It is an empowering experience for a child to make his or her own toy and to be the one to orchestrate the whole thing. But how do you teach that to a five year old kid so that he or she could use a 3D printer? Well, just like any other thing you want to teach - Let them experience it first hand and make something. When I installed the printers in the kindergarten, the kids looked at them with wonder. I told them that we are going to print our own toys, but could clearly notice they didn't understand the meaning of it. At one point a kid asked me if she could bring a doll to put in the printer. I had to start from the very beginning and introduced the kindergarten to Tinkercad, a browser-based 3D solid modelling tool for rapid prototyping known for its entry-level ease of use. It has an intuitive interface and is a great tool to demonstrate the meaning of 3D. At first I would pick and arrange a few bodies and show how they appear from different points of view. A sphere would be seen the same from all angles, but a cylinder could appear as a square or a circle. The arrangement of the bodies in the space also affects how a body might hide behind another. The kids got the hang of it in a few days. They played with the software and we saved their projects just like we did with their drawings on Paint. To demonstrate the concept of layers in a 3D printing process, I developed an easy activity in which the kids take an active part in. I chose three identical cylinders and placed them on the printer bed in different orientations. We talked about the way the three are positioned and I asked them to draw the three shapes as they see them on the screen. It was interesting to see it through their eyes, most of them weren't able to draw it perfectly, but the exercise was good. I then asked them to choose a color for the first layer and started printing. At 25% I paused the printer and asked them to draw the partial print they see. I let them choose and switch to another color, resume the print for another 25% and pause. During a print, the bodies are "open", the outline of the layers are clear and the infill is visible. Again I let them draw what they saw, this time with two colors. We kept on through the day until all four layers were finished and we had three cylinders with the same dimensions and different color distributions. In this exercise the children get to be a part of converting a digital shape into a solid object. I think the best way to understand the concept and logic behind 3D printing is to experiment with it yourself. Here are some toys the kids chose from Thingiverse. I also designed 3D name signs and each kid chose the colors for base and letters. Today I made a kid cry... actually, it happens almost every day. Every child, no matter the age, gender or race needs to express himself and each child does it in his own creative way. Sometimes a certain behavior is considered bad, inappropriate or infantile, but if you stop to think why a child behaves a certain way you might find out there is a good reason for his behavior. I don't want to brag, but I am very good with kids, I know how to talk to them and more importantly how to listen. I've always had good connection with them, starting with babysitting when I was about 12, continue when my youngest sister was born and then with kids of family and friends. I see kids as small adults, and I talk to them as such. I believe that when you talk to a child as a friend and an equal you get to hear their true thoughts. Before I started working as a teacher my biggest fear was that I wouldn't be able to befriend the kids. As a teacher I have to show my authority and maintain discipline, but it contradicts the way I'm used to behave around them. I still can't say that I mastered the combination. Today we built a game that the kids can play by dropping marbles into two cylinders and summing up all of them to work on basic math. During the assembly process one of the kids (I'll call him Dan) asked me if he would be able to get the marbles and I replied that he would get them as soon as we finish building everything. Dan was relentless in his inquiries to a point he wore me off and I told him he wouldn't get the marbles. He was offended and went to the corner to cry. When we finished building the game I gave the marbles to the two kids that helped me and went to talk to Dan. I explained to him that he was not participating and interrupting the other kids and that his involvement in the building process was important to me. Dan understood and went to play the new game with his friends. I think it was better if instead of telling Dan he won't get any marbles, I had stopped everything and had a talk with him. Maybe that way he would have had the chance to participate in the process as well. I'm constantly learning, the interaction with the kids teaches me there is more than one solution to a problem and the best way to find it is to talk with the kids, get to know what they think, feel and want and let them know they are heard. After 6 months of working as a kindergarten teacher I can truly say that I have found my calling. It has been a wonderful experience so far. Digitaf is the first technological kindergarten in Israel and its vision is to dare dream, imagine, and design the future kindergarten. Our goal is to examine whether it is important to promote the use of technology at the early childhood, and how to develop skills for the 21st century. At this point we do not provide answers. We are asking, experimenting, learning, and enjoying the experience. Like any kindergarten, it's purpose is to provide an environment that supports and strengthens the processes of early childhood development by sensory experience, exploration, choice, personal initiative, interaction with other children and adults, productivity and creativity while combining digital media during the children's daily activities. In this photo is a toy figure of me that we made as a part of the toy project. 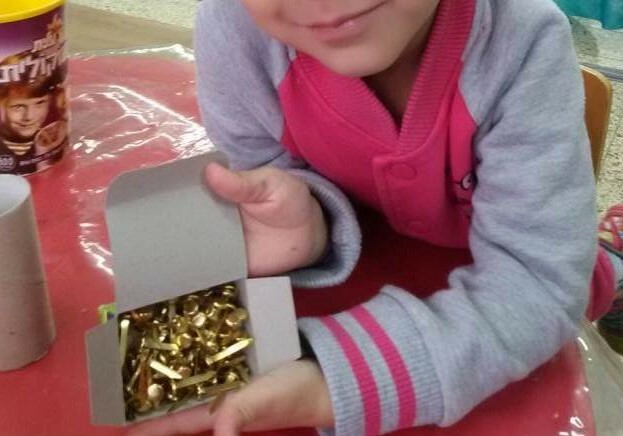 The toy project is an ongoing activity that we run all year long: The kids bring old toys from home and we repair, modify or disassemble them while learning what they are made of and how they work, and then we use the parts to create new toys. For as long as I can remember I always took things apart. I opened up watches, walkmans, flashlights, cameras, remote controls and toys, lots of toys. As a kindergarten teacher, I see that disassembling something can teach a lot. The physical part improves fine motor skills, hand-eye coordination, strength and confidence. The knowledge obtained by by disassembling something is unique in a way that it can't be taught without hands on experience. Before opening up anything, I first ask the children to describe what's inside, how it work and how would it look like. And I let them draw the inner parts out from their imagination. This stage is very important because it forces the child to stop and think, remember or imagine and become a part of the process. After the kids draw the inside, I hand them tools and they start locating the screws, identifying their types and opening them, sometimes I help loosen them. After a few times a kid repeats that process, he or she will become more confident with it and will eventually be able to do it alone. When everything is apart, we arrange all of the parts by types, I tell them the name of the parts, their purpose and we have a short conversation. I then ask the kids draw what they see in front of them. We compare the before and after drawings and talk about what we've learned. 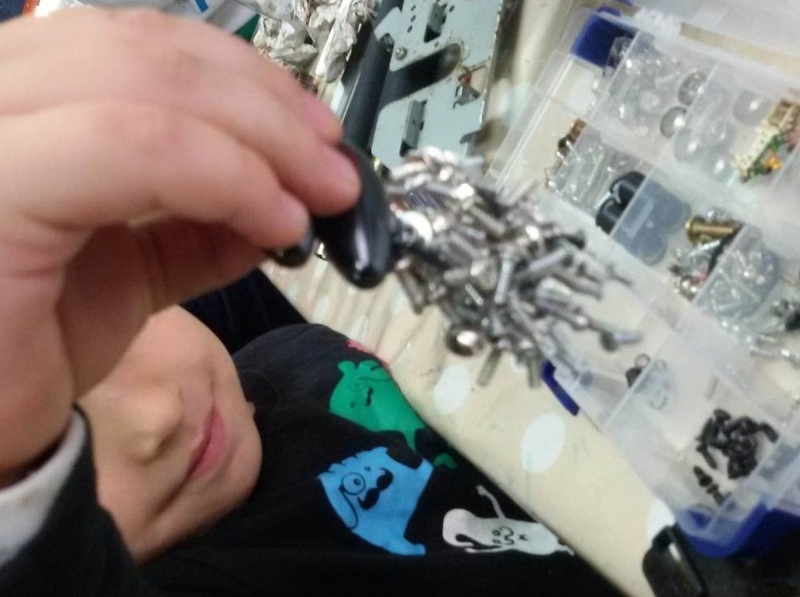 Be aware of unwanted disassembling, some of the children are now locating screws everywhere and wanting to unfasten them, don't leave the screwdrivers unattended. I just came back from the Netherlands, K and I went to run the Amsterdam Marathon. I had been training for over 6 months and it was a great experience. It was cold and chilly during our stay, but it turned out to be a good thing because it is much easier to run when it's cold. after one training run on a Friday, I managed to connect on Skype with the kindergarten and have a nice chat with the kids. I showed them the train on the avenue in front of our apartment, the many bickers riding through the freezing wind and told them some nice facts about Amsterdam. The Marathon was not as hard as I had expected. I was fortunate to train in the summer of Tel-Aviv with unbearable heat, when it was possible to go out running only after 9 PM. I managed to beat my goal time and finish the race in 3 hours and 22 minutes.